Poor nutrition habits can be a behavioral health issue, because nutrition and diet affect how you feel, look, think and act. A bad diet results in lower core strength, slower problem solving ability and muscle response time, and less alertness. Poor nutrition creates many other negative health effects as well. According to a National Center of Health Statistics 2003 survey, about 65.2 percent of American adults are overweight or obese as a result of poor nutrition. Obesity is defined as having a body mass index (BMI) of 25 or more. Being overweight puts people at risk for developing a host of disorders and conditions, some of them life-threatening. The National Institutes of Health reports that hypertension is one of the possible outcomes of poor nutrition. Hypertension, also known as high blood pressure, is called the silent killer, because it frequently remains undetected and thus untreated until damage to the body has been done. Eating too much junk food, fried food, salt, sugar, dairy products, caffeine and refined food can cause hypertension. Poor nutrition can lead to high cholesterol, which is a primary contributor to heart disease. High fat diets are common in the United States and Canada. The National Institutes of Health reports that more than 500,000 people in the United States die each year due to heart disease, which can be caused by a high fat diet. High cholesterol foods contain a large amount of saturated fat. Examples include ice cream, eggs, cheese, butter and beef. Instead of high fat foods, choose lean proteins such as chicken, turkey, fish and seafood and avoid processed foods. Diabetes also can be linked to poor nutrition. Some forms of the disease can result from consuming a sugar- and fat-laden diet, leading to weight gain. According to the National Institute of Health, about 8 percent of the American population has diabetes. A stroke that is caused by plaque that builds up in a blood vessel, then breaks free as a clot that travels to your brain and creates a blockage can be linked to poor nutrition. Strokes damage the brain and impair functioning, sometimes leading to death. Foods high in salt, fat and cholesterol increase your risk for stroke. According to the National Institutes of Health, poor nutrition can lead to gout. With gout, uric acid buildup results in the formation of crystals in your joints. The painful swelling associated with gout can lead to permanent joint damage. A diet that is high in fat or cholesterol can cause gout. Some seafood--sardines, mussels, oysters and scallops--as well as red meat, poultry, pork, butter, whole milk, ice cream and cheese can increase the amount of uric acid in your body, causing gout. According to the National Institutes of Health, several types of cancer, including bladder, colon and breast cancers, may be partially caused by poor dietary habits. 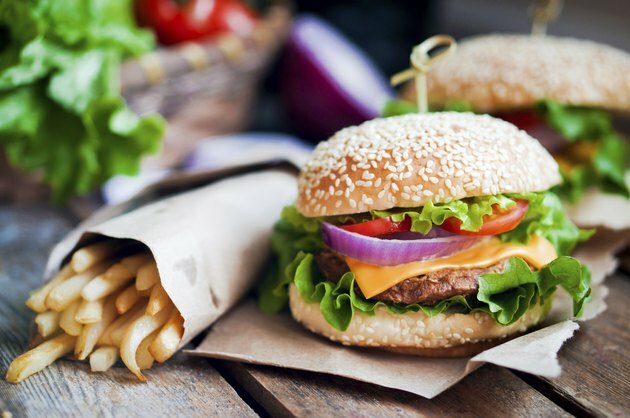 Limit your intake of foods that contains refined sugars, nitrates and hydrogenated oils, including hot dogs, processed meats, bacon, doughnuts and french fries.